From clothing and household items to jewelry and more, the HSCO Thrift Store on S. Hwy 97, across from Wal-Mart in Bend is loaded with great deals for every bargain hound! If you’re moving, downsizing or spring cleaning, please consider donating to HSCO’s Thrift Store. We respectfully request donated items be saleable and in good condition. Broken or soiled items actually take funds away from the animals due to costs of disposing unusable donations. When you drop off your donations, take a moment to see the fine collectibles, fine jewelry, antiques and other treasures in the HSCO Thrift Store. The Humane Society Thrift Store graciously accepts the donation of automobiles, trailers, RV’s, boats and motorcycles in good working condition. 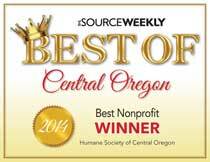 The Humane Society of Central Oregon is a private non-profit solely supported by donations and fundraisers. 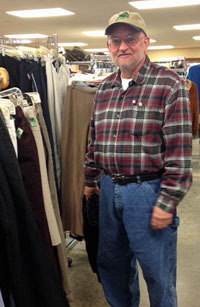 A critical revenue source for our shelter operations is our Thrift Store in Bend. View the map to our locations here. ‘Like’ our Thrift Store on Facebook! ALSO: Check-out our new Pawsitive Books on Amazon! You’ll find great bargains on books!